Bahía San Gabriel & Puerto Balandra (La Paz) - Beauty and The Beast! Golf course near La Paz's Costa Baja Resort Marina. Brand new buildings rise out of the desert in La Paz. Future development plans are marked in the desert hills. Boats of all sizes enjoy La Paz harbor. Inviting park benches line the malecón. 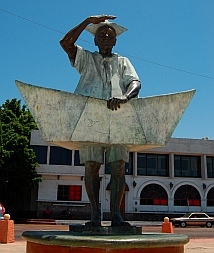 Evocative statues enliven the malecón. The malecón is a great place to sit a spell. Carlos Slim's super yacht drops in for a few days. The Mexican Navy kicks off the Semana Santa (Holy Week) celebrations in dress whites. Mexican Navy ships behind us. Embroidered and knitted items for sale. Manual orange juicers in a kitchen shop. lycra snorkeling suits for us. Lagoon entrance at Puerto Balandra. Happy afternoons in the cockpit. the Sea to make our way into another big city: La Paz. of Cortez and the Pacific Ocean (see Mexico Maps). a brief visit to La Paz. of hosting well-heeled tourists for many years to come. the screams of the kids on one of the slides. and a very large book exchange. the many cruising boats anchored in the harbor. neglected to bring with us from San Diego. the fixings, we scarfed a few fish tacos, and grabbed a variety of brands of flour tortillas for the galley. Mexican Navy in celebration behind us. sharp in their dress whites. Office Max, Subway, McDonalds and others. town makes custom fitted snorkeling suits. and a lot of abrasion protection. 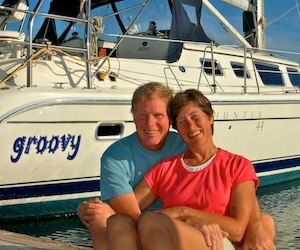 we started at Bahía San Gabriel at the southern end of Isla Espiritu Santo. part of the shore, and the long white sand beach begged to be walked. to shore and a slow walk-swim-walk together along the water's edge. quite surprised when the boat began to roll mysteriously. An ominous, low roar gradually filled the air around the boat. scrambled down below again. What the heck? pronunciation of the name of British privateer Samuel Cromwell. "a cool evening breeze," which it may be if you are on a protected patio somewhere. found such a spot at Puerto Balandra. boat dried out in an hour or so. Mark and on New England beaches for me. afternoon, and Mark got inspired to strum a few tunes. Find La Paz and Puerto Balandra on Mexico Maps. 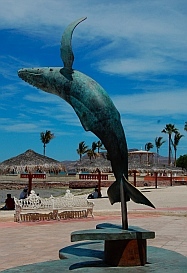 This entry was posted in The Sea of Cortez and tagged Mexico, Shutterbug, The Sea of Cortez, Travel by Roads Less Traveled. Bookmark the permalink.